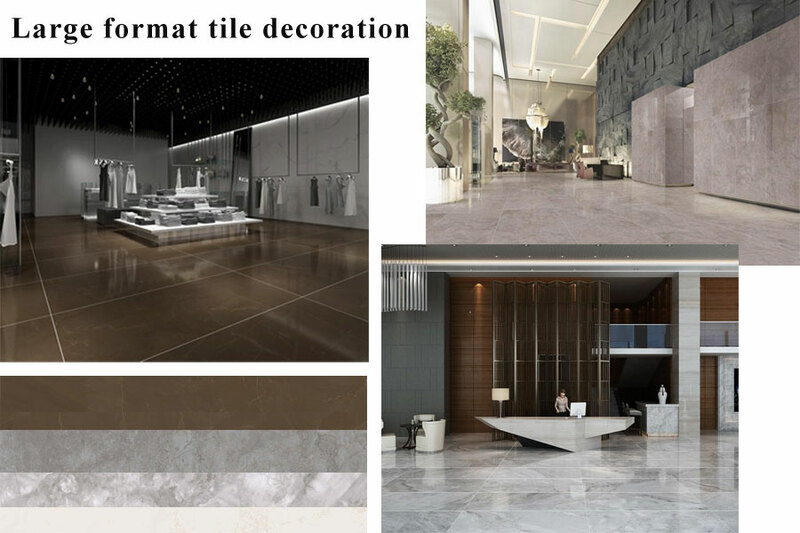 Product categories of Large Format Tile, we are specialized manufacturers from China, Large Floor Tile, Large Wall Tile suppliers/factory, wholesale high-quality products of Large Format Porcelain Tile R & D and manufacturing, we have the perfect after-sales service and technical support. Look forward to your cooperation! Custom tile has developed rapidly, and the customization of multiple styles, multiple specifications and different materials is endless. The large format porcelain tile is a perfect piece of tile customization. In addition to its outstanding practical performance, the large porcelain tile has the characteristics of rich specifications and free cutting. "Seamless connection" basically does not need extra shape and cutting, one by one, the overall effect is simple and atmospheric, the shocking visual impact and beauty are unmatched by ordinary tiles. Especially for some large-area walls and floors, the large wall tile has better visual effects. Designers can cut large-sized tiles according to their design requirements. After cutting and processing, they can get the most suitable tiles of the specifications. The large floor tile is more artistic and more creative in home applications. Tiles provide a broader design space for home customization.